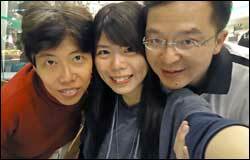 Alvin Lee Chi-wing's family of three, who make about HK$60,000 a month, have welcomed the tax relief measures. The secondary school teacher, who conducts liberal studies classes, said he pays almost HK$100,000 in salaries tax - close to two months of his family income. Lee also has to pay HK$40,000 a year for his daughter's university education. The relief measures means his tax bill will be around HK$14,750 less. Of this, the bulk of his savings will come from the HK$12,000 tax rebate, while another HK$2,000 flows from the increased tax allowance for married people and basic tax. Rounding up his savings will be the around HK$750 he does not have to cough up as a result of increased allowances for supporting his parents and daughter. Coupled with the HK$2,500 rates waiver for each quarter - or HK$10,000 a year - and the HK$1,800 electricity subsidy, savings for the family add up to around HK$26,550. Lee, chairman of the Voice of Middle Class, said although the measures and sweeteners are able to soothe the middle-class hardship to a certain extent, more can be done. He called for the introduction of a tax allowance for those who need to pay mortgages. "I am lucky that I have already paid off my mortgages," Lee said. "But life is difficult for those who still have to pay for their mortgages." He said some of his friends who are on a monthly household income of about HK$40,000, especially those with children and who need to pay off mortgages, are having a hard time making ends meet. Another in the middle-class bracket, Lai Chung- ming, expressed satisfaction with the budget, saying it supports people like him and those earning less. "However, I find that John Tsang is not keen on carrying out long-term measures," said Lai, who works in the financial sector and paid HK$40,000 in taxes last year. Lawyer Stanley Chan Wing-leung was another who was appeased, saying the budget is better than last year's and helps the middle class.